Sora-Ama Hostel is a new hostel which opened in August 2016. 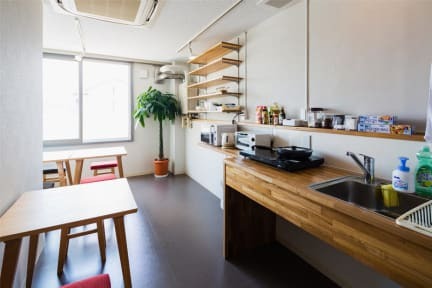 We are located in the center of Takayama, only a 3-minute walk from JR Takayama station and bus terminal, andl a 5-minute walk from Old Town. Our hostel has a dormitory room on the 3rd floor and family rooms on the 4th floor. Each floor has Wi-Fi, air-conditioners, new and clean shared shower rooms, restrooms, kitchens and dining areas respectively. For the dormitory room, we offer single beds and bunk beds. Each bed is surrounded by walls at your head and sides, and by curtain at your foot end, so you can shut yourself off from the room and keep your privacy. Also, each bed has laptop-size safe box, LED light and plug-in. Each single bed has storage space beneath the bed for keeping your luggage, and each bunk pod bed has ventilation fan for fresh air. In the dormitory room, there are counter tables and stools for reading books or using laptops. 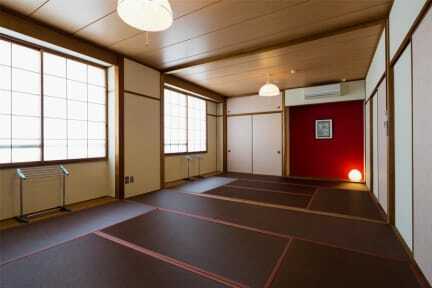 The family rooms are Japanese-style rooms with tatami-mat. The larger room is for maximum 7 people, and the standard rooms are for maximum 4 people. You can sleep on a floor, on a Japanese futon (no bed). Our guests can use the roof balcony with tables and chairs where you can enjoy scenic view of surrounding mountains. (1) The guest can cancel free of charge until 3 days before arrival. (2) The guest will be charged the whole nights if they cancel in the 2 days before arrival or NO SHOW. The space is clean and the staff is very nice and always helpful. I had a really nice and relaxing time and I’d go back if I had to stay again in Takayama. Clean and comfortable hostel in a great location! Staff are very friendly. Would recommend to anyone traveling to Takayama. Love this hostel. Lovely lovely staff. Helpful and kind. Quiet hostel but little kitchen to hangout with others/ make food. Clean and good facilities. Excellent location. Again amazing staff. Small hostel. Recommend. My favourite place to stay when I am in Takayama! Great location, clean and quiet, and nice staff. Highly recommend. It was big compress to other hostel and value of money. But it’s a bit far from train and subway for those who doesn’t want to walk much. Also entitled hostels have only shower room in one floor only. Sometime it a bit hard but manageable. Overall it’s a good hostel. This hostel was so clean and really allowed you your own privacy. Well situated, helpful staff, good (and clean!) facilities, spacious bed, nice atmosphere. Nothing bad to say about it; enjoyed my stay.